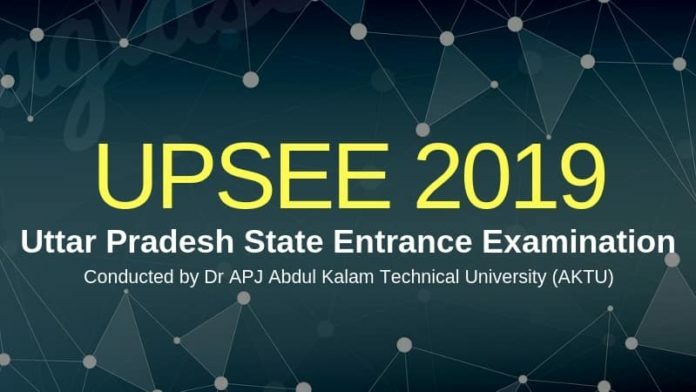 UPSEE 2019 – After conducting Uttar Pradesh State Entrance Exam, AKTU releases the answer key. UPSEE 2019 exam date is April 21, 2019, and the candidates can download the answer key in the evening, from this page. The answer key of UPSEE is released as pdf, for B.Tech, B. Arch, B.Des, B.Pharm, BHMCT, BFAD, BFA, MBA, M.Tech, M.Pharm, M.Arch, M.Des papers. The result of state level exam will release in May 2019. Check more details about UPSEE 2019 from this page. Latest: AKTU has releases UPSEE 2019 Answer Key after the exam. Check here. 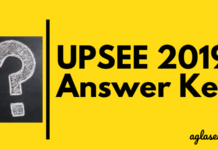 After the exam is over, AKTU releases the Answer Key for UPSEE 2019 at its official website, upsee.nic.in. Candidates can download the UPSEE 2019 Answer Key and use it to cross-check answers in the exam and calculate the probable score. With the help of the UPSEE 2019 Answer Key, the candidates can estimate their chances of qualifying the entrance examination, way before the result declaration date. The calculation of marks has to be done as per the marking scheme is given by the exam conducting body. After the release of the Provisional Answer Key, the candidates shall also get an opportunity to submit the objection in the UPSEE 2019 Answer Key. On the basis of the objection submitted by the candidate, a final answer key will then be published. 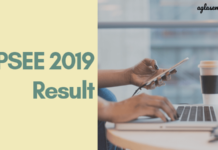 UPSEE 2019 Result is declared online at upsee.nic.in. AKTU takes the prescribed UPSEE marking scheme into consideration to declare the result. Each course for which UPSEE 2019 is conducted has a separate merit list. The important thing to note here is that AKTU provides the facility of reevaluation to all UPSEE candidates within 7 days of result declaration. Candidates are required to submit Rs. 5000 per paper. Further on the basis of UPSEE 2019 scores, a candidate is called to appear for UPSEE 2019 Counselling round. The candidate who qualifies the offline UPSEE 2019 exam and makes it through the merit list becomes eligible to participate in offline UPSEE 2019 Counselling. The successful candidate shall be intimidated by the UPSEE 2019 counselling schedule through Newspaper and official website. However, the allotment of seat shall depend on the availability of the seats on the day of UPSEE 2019 counselling. The candidates have to be physically present at the allotted time and date along with all the relevant UPSEE list of documents. The UPSEE counselling authorities do not entertain any request regarding the change of allotted date, time and venue for the counselling. The exam schedule is mentioned in the admit card. However, below we have provided the paper-wise exam timings. The candidates have to appear in their respective exam centre as per the timings in the admit card. Note that all the papers are to be held in one day but at different times. UPSEE 2019 Admit Card has been released over the official website for all the registered candidates. The candidates have to download the admit card by logging into their account using their application number and password. The admit card is not sent via post. Note that UPSEE 2019 Admit Card is the only document that allows the candidates to enter the exam centre. However, the admit card is valid only if accompanied with a valid photo Id proof in original. The admit contains the exam centre, date and time and the candidates must take the UPSEE 2019 exam as per the directions in the admit card. UPSEE 2019 is held for admission in the following courses. For all the courses the papers are different. The candidates thus have to appear in the respective paper as per the course they have selected to take admission in. As per the tables above one thing is clear the there is some common pattern that is the marks per questions. Each question carries 4 marks in all the papers. There is no negative marking in any paper. The exam will be conducted offline in different states in various slots. The candidates will have to reach the allotted test centre at least 30 minutes before the exam centre. Possession of No objectionable items will be accepted. Hall ticket and Identity proof (for identification) will be required to enter the test centre. The multiple choice type examination for admission to P.G. (M.Tech. / M. Pharm. / M.Arch. / M.Des) shall be conducted offline in OMR pattern at the specified centres. After that you have checked the UPSEE 2019 exam pattern and marking scheme, the next most important part of the preparation is to know the UPSEE 2019 syllabus for all the 8 papers. The UPSEE 2019 syllabus comprises of the important topics which one need to prepare for the entrance exam. Candidates can download the syllabus pdf from below and start covering all the important topics. Click Here to open the above pdf in a new window. Candidates can opt for any of the following exam cities to appear for UPSEE 2019 in offline mode. Once a candidate has provided their test centre preference for UPSEE 2019, it cannot be changed. The preference is to be mentioned in the application form itself. UPSEE 2019 Application Form Correction window opens under the login of the registered candidates. The application form correction is a one time opportunity for the candidates to make changes in the application form. The candidates can also claim the EWS quota in the application form starting from March 16, 2019. Apart from these details, all fields are available for corrections. There are no additional charges for the changes made in the form. Candidates are required to apply online for any of the 8 papers that UPSEE is conducted for. To apply for UPSEE 2019, the aspirants need to register first and then proceed to submit the application form. At the time of the registration, you should provide your own valid Email id and Mobile Number. In the UPSEE 2019 Application Form, the aspirants need to fill in their Personal details, educational qualification details, etc. Also, you need to upload scanned images of your photograph, signature, caste certificate, etc at the time of filling in details in the UPSEE Application Form. To submit the form, you need to pay the requisite amount of the registration fee. After the payment is done, it is advised to the candidates to take a print of the application form for future reference. To submit the application form, the candidates need to pay the following amount of Application Fee. Mode of Payment: The aspirants can pay the above-given application fee by online mode using Credit/ Debit card/ Net banking. Now, that the UPSEE 2019 Information Brochure has been released, the following changes have been observed in this state entrance examination. Earlier, UPSEE used to be held in Online mode for some papers, while for others it used to be held in Pen-paper mode. However, now it is going to be conducted in Offline mode only. Till last year, the entrance exam used to be conducted in multiple sessions but now it is going to be conducted in a single day only, in multiple shifts. 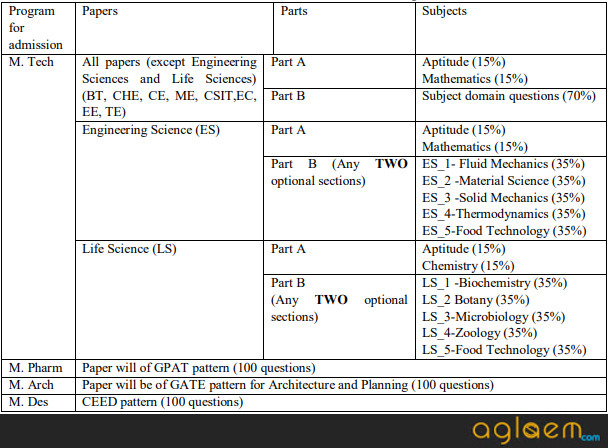 Last year, AKTU conducted the entrance exam for 11 papers, which has now been reduced to 8 papers. Students should check the eligibility criteria for the entrance exam before proceeding to apply for the exam. UPSEE 2019 is open to all candidates. 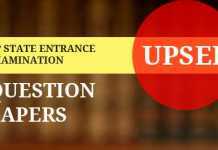 Candidates who have passed the qualifying examination from any institution located in UP or outside it or those whose parents are domicile of UP are eligible to apply for this entrance exam. The candidates can check the complete eligibility criteria from below. Candidates should have passed in the following subjects in their respective UP Board/ Class 12 level examination from any recognized Board. Corresponding documents proof for passing in this exam needs to be submitted at the time of counselling. B.Tech. (Agriculture Engg.) Agricultural discipline. For B.Tech.*/B.Pharm./B.Des./MCA(Integrated),B.Tech. (Agriculture), M Tech (Dual Degree) admission, a candidate needs to secure at least 45% of marks in average( 40% marks for SC/ST Category candidates). A diploma holder in B.Tech will require the same percentage of marks. For BHMCT/BFAD/BFA/MBA(Integrated)/B Voc admission, a candidate requires the same marks on average as for B.Tech./B.Pharm./B.Des./MCA(Integrated), M Tech (Dual Degree) admission, that is 45% on average and 40% on average for SC/ST candidates. But in case of a B.Arch aspirant, he/she needs to secure a minimum of 50% marks in average as well as 50% in each of these subjects – Physics, Chemistry, and Mathematics. *Candidates applying for B.Tech courses are also eligible for B.Tech(Biotechnology) and B.Tech(Agriculture) course. The candidate must ensure the minimum eligibility conditions of their admission/selection to the respective courses as prescribed by the academic council of the University. 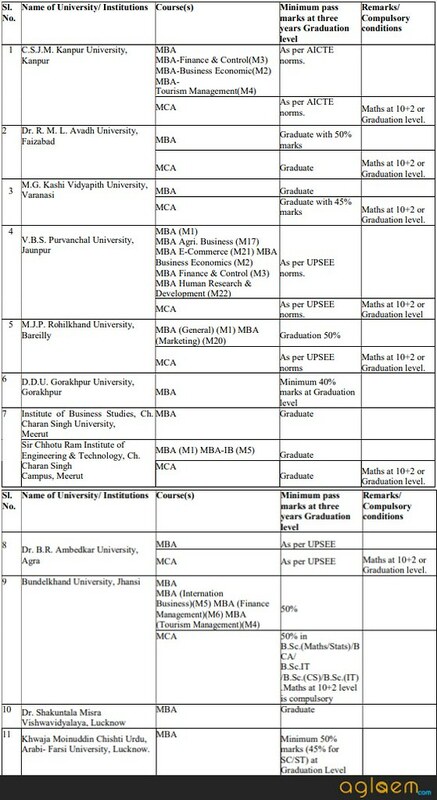 The minimum eligibility conditions for admissions to postgraduate programs (M.Tech. / M.Pharm. / M.Arch. / M.Des) are listed below. For MBA Admission, a candidate needs to secure a minimum of 50% of marks(45% of marks for SC/ST candidates) in their graduate level of studies from a recognized colleges/institutes. For MCA Admission, a candidate needs to secure a minimum of 50% (45% for SC/ST) marks in aggregate from a recognized Institute. But, he/she must have pursued Mathematics at Class 12 or Graduation level. Other than these eligibility criteria, a candidate is required to even fulfil some of the University/Institution specific eligibility criteria as well, as shown in the picture below. AKTU doesn’t provide direct admission in case of B.Arch./BHMCT/BFAD/BFA/MBA admission. Candidates applying for lateral entry in either of these courses are required to fulfill the following criteria and should make a note of the same. All of these courses are affiliated to AKTU, Lucknow. So, a candidate applying should have passed their qualifying level of the exam from UP and whose parents are domicile to UP State are eligible for admission to any of these courses. In case a candidate is an engineering diploma holder from UP, he or she should have secured a minimum of 45% marks (40% for SC/ST) on average, along with his/her parents being a domicile holder of UP State is eligible for lateral admission for Agriculture Engineering Branch. Note that, a candidate should not be a diploma holder in either Agriculture Engg. or Pharmacy or Architecture, in order to be eligible. An agricultural engg. diploma holder must have passed with minimum 45% marks (40% for SC/ST candidates) from any BTE(Board of Technical Education) recognized Institutes in UP. A B.Sc passed candidate needs to pursue mathematics as a core subject in their 10+2 level, in order to be eligible for lateral entry admission. 45% marks (40% for SC/ST) on average is required in order to be eligible. Such candidate should be all clear in the following subjects – Engineering Graphics/ Engineering Drawing and Engineering Mechanics. In the case of 2 or 3-year diploma holder in pharmacy(from an institute outside UP) should secure 45% marks (40% for SC/ST) in aggregate, along with parents having domicile of UP are eligible for lateral entry admission to B.Pharm. A candidate should have passed their graduation in BCA, B.Sc (IT/ Computer Science) and should have secured a minimum 50% (45% for SC/ST) marks in aggregate, in order to be eligible for admission. Mathematics, as a core subject is needed for admission. Non-Resident Indian(NRI) candidates are provided with direct admission under 5% seats of total intake in State Funded and Private Institutions of Uttar Pradesh. This reservation is applicable to all the courses except MBA/MCA. The provisional selection of NRI candidates is made on the basis of SAT II Score. NRI aspirants interested to pursue B.Arch are required to appear for the aptitude test on the day of UPSEE 2019 Counseling. An NRI candidate is therefore required to meet all the eligibility criteria, as specified for them. Should have taken SAT II examination with the second C level of Mathematics, along with Physics and Chemistry. Minimum Marks Requirement – 60% marks in average (55% for SC/ST candidates) in 10+2 or equivalent level. Provisional merit will be given to such candidates on the basis of the marks obtained in the PCM subjects. Such candidates need not to appear for UPSEE 2019. Candidates must be able to show their valid document proof, as and when asked by the UPSEE 2019 authorities(mostly at the time of counselling). To know more about NRI quota and its related information, a candidate is asked to stay updated with the official website in the month of May 2019. Admission is provided to such candidates on the basis of the scores secured in the qualifying level of exam. Candidates falling under this reservation needs to fulfil the following criteria. Subject Combination – Should have pursued Physics, Chemistry, and Mathematics in 10+2 level. Requirement – Copy of passport or equivalent evidence support of their Nationality. UPSEE Member Private Institutes are not allowed to provide more than 25% of reservation quota to any other domicile state candidates(other than Uttar Pradesh). NRI Candidates, opting for this quota shall be allotted the seats under 15% reservation in private institutions. In case of any vacant seats after counselling round, seats shall be filled within 15 days of the last date of counselling as per the preference order, mentioned below. JEE Main qualified candidates shall be preferred firstly, on the basis of their ranks in B.Tech/B. Arch JEE main exam. Top scorers of the qualifying level of examination as per the norms of AICTE. Candidates are notified regarding the filling of the vacant seats via advertisements in newspapers, institute website, at least a week prior to submitting applications under this reservation. Note that, B.Arch applicants need to appear for Aptitude test, on the day of counselling. Minimum Marks Requirement – 45% (40% for SC/ST) for B. Tech./B. Pharm aspirants, whereas 50% (45% for SC/ST) for MCA marks in aggregate. Grace marks will not be considered under any of the eligibility criteria/quota for UPSEE 2019. The information brochure for UPSEE 2019 has been released and consist of all the necessary information about the exam. As the information brochure, the exam for all Papers is going to be conducted in Offline mode. The candidates can check the information brochure from below. Click here to check the Eligibility Guidelines for Admission to PG Programs. Click here to download the UPSEE 2019 Brochure in Hindi. Correction date is over now.